While on top of South Hill on Saturday August 22, 2009 I came across these gems. All of the stone mounds are placed on earth chakras (energy vortices) as I have been writing about for some time. When you cover an earth chakra earth prana is prevented from entering it. This helps charge the air and I believe were done for spiritual purposes. Today's findings are not only further confirmation of this but they show incredible ingenuity. http://hi-torstone.blogspot.com/. I agree with Robinson. Given that the stone mounds are thousands of years old they are in great condition for their age. The mound in the first picture is on 3 earth. 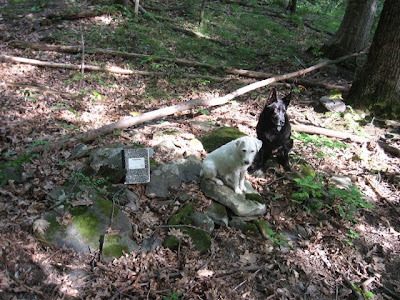 The two dogs in the picture (white-Pepper, Black-Lucy) are sitting on earth chakras. The notebook is located on a natural vortex of Cosmic prana and is a strong indication that the mounds were used for spiritual purposes. A vortex of cosmic prana forms when spiritual practices such as meditation, prayer, ritual and or ceremony are practiced at a location. 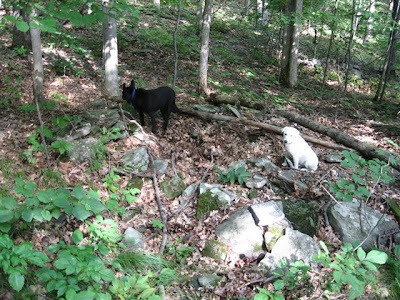 The second picture shows a series of a stone mound covering 7 earth chakras (Lucy and Pepper are on two of them.) What is interesting, ingenious, about this mound is that it is circular in form and the center is empty. This has the affect of creating a natural vortex in the center. WOW! The next picture demonstrates this better. 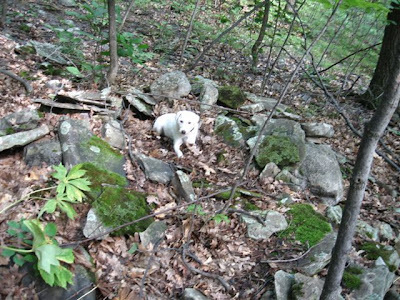 The last picture shows Pepper sitting in the center of a stone mound located on 4 earth chakras. A natural vortex has formed in the center. Later at home while I was watching a movie I broke into tears. I mean serious tears, as I begged God to give me the strength to do what he/she wants of me. It was powerful moment. I believe that I was picking up on the thoughts and intentions of the many people that had spent hours or even days praying for a vision, or communion with God/Spirit. Thought forms can linger for a long time at a place, particularly if done by spiritual people in a very emotional and fervent way. I call the thoughts that attach to a place geograpic samskaras http://www.jubileeinitiative.org/samskaras.html and they can be a poweful aid in faciltating spiritual experiences. That is why I always try and guage geographic samskaras in surveying sacred sites. Combine this experience with the several cosmic prana vortexes that I found and it is clear that the covering of earth chakras was done for spiritual reasons; most likely to what we now call "vision questing." I went to South Hill hoping that I would get some sort of confirmation about whether I should write up a report about the stone work done by the Mound builders at South Hill . I have been told. PS This would be a great place to go vision questing and to connect with the divine. Magnificent.